As the capital of the United States, Washington, D.C. attracts visitors from around the globe. Tourists, journalists, and businessmen alike flock to the city for work and entertainment. There are a wide variety of neighborhoods to explore and plenty of excellent restaurants. It's a very diverse city and that is reflected in the cuisine, entertainment and sights around town. Although accommodation can be somewhat expensive, there is no shortage of free activities around town so you can budget more for your room. The metro is the perfect way to get around town so make sure wherever you stay is in walking distance to a subway or bus stop. This boutique hotel sits at the corners of 16th and M Streets. It's just four blocks from thw White House and is near Embassy Row and the National Geographic Society. It's also just one short mile from the Washington Monument, Ford's Theater, and the business district. The building dates back to 1923 when it was originally luxury apartments but in 1955 it was converted to a hotel. There is a lot of history at this hotel and many important visitors have passed through. It's style combines both European and Washingtonian elements. The staff go out of their way to ensure that your stay is extraordinary, and you will quickly feel right at home in this luxurious hotel. The hotel also offers it's guests many features and amenities. There is a 24 hour fitness center that is located on the lobby level. There are also two restaurants and a lounge where guests can enjoy delicious meals all day long. Concierge services and personal butlers are also available. The rooms are elegantly decorated with Italian marble bathrooms and oversized walk in showers. This unique hotel sits on the edge of the Potomac River in the beautiful neighborhood of Georgetown. It's conveniently located near everything but still in a quiet and comfortable location. There are 57 luxury guestrooms and suites available and visitors can choose from rooms with private decks and terraces. The hotel also has two dining areas available. On the lower level of the hotel is A.G.B. which serves a wonderful breakfast and dinner every day. Higher up, The Observatory is a rooftop bar and lounge. There guests can enjoy views overlooking the city. Other amenities available to guests include a 24 hour business center, a fitness center, and concierge services. The hotel is also equipped with wireless internet service. Rooms are well furnished with plasma televisions, marble bathrooms, and designer toiletries. Room service is also available for guests convenience. This hotel, located in the hip Dupont Circle neighborhood, is very close to the Dupont Circle Metro Station and only a block from Embassy Row. It's a great place to stay with a lot to offer visitors. There is a gas fireplace, red velvet furnishings and elegant orchid arrangements decorating the place. It also has marble floors, giving it an elegant and grand atmosphere. Amenities available to guests include a restaurant and lounge on site. Breakfast, lunch and dinner are served. Guests can also order from room service during specific hours. Other resources include translation services, cleaning, laundry and a concierge. A business center is available and equipped with three computers and three printers, a fax machine and a photocopy machine. Guests can also enjoy a 24 hour fitness room. The hotel has 314 rooms that are designed in a contemporary style. Each has a plasma television, minibar, and weekly newspapers. Complimentary internet is also available. This high end hotel is located right in the heart of Washington, D.C. It sits peacefully on a quiet street that is lined with trees in the Foggy Bottom neighborhood. It's surrounded by pleasant, residential brownstones and is just a short stroll from the metro. From there you can access most of the sights around town including museums, memorials, monuments, shopping and more. Specifically, what sets this hotel apart from others is that it does not offer basic rooms, but instead only offers suites. Each suite has a living room and full kitchen, so you can truly make yourself at home during your time in the nation's capital. Kitchens are equipped with a full sized refrigerator, a stove, microwave, sink, coffeemaker, cookware, and dishes. There is a sofa bed in the living room. You can prepare your own meals in your personal kitchen or dine in the on site restaurant, Dish, which serves updated American comfort food and regional wines. 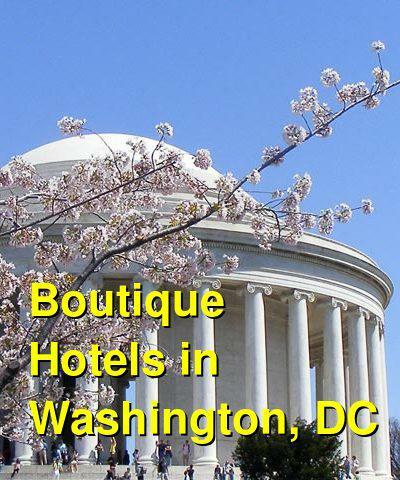 This boutique hotel is located on Pennsylvania Avenue and has easy access to George Washington University, the World Bank and IMF, and many of the most popular downtown sights. It offers a charming charcter and personalized attention to every guest. It's decorated with 1920s decor and is designated as a Historic Hotel of America. You can choose between guestrooms and suites, each of which is furnished with modern amenities, plenty of comfort, and a unique style. The hotel is also just a short distance from the metro's Orange and Blue Lines. It's also only 15 minutes from Reagan National Airport and 40 minutes from Dulles International Airport.